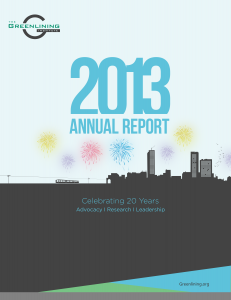 We are excited to share with you our 2013 Annual Report. 2013 was a remarkable year for The Greenlining Institute, in which we published 11 reports, organized more events than ever, and played a key role in shaping legislative developments and regulatory decisions in Sacramento and Washington. We also made plans to reclaim a failed bank building in downtown Oakland and transform it into not only Greenlining’s new home, but a hub for innovation, collaboration and revitalization.